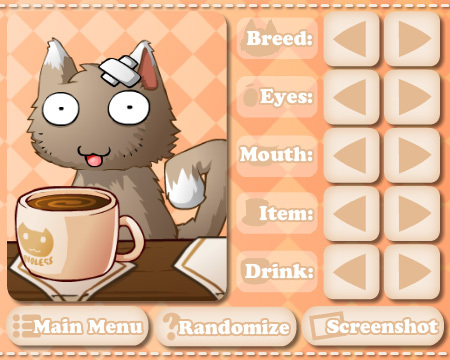 This is pretty much the same thing as that “Cat Maker” I posted earlier, but with a new interface. I’m a bit worried that the buttons might be a bit small on devices with small screens, so if that ends up being the case, I’ll have to rearrange things a bit. Anyway! The main thing to notice here is the “Screenshot” button! Click that and you’ll get a wee JPEG of your cat saved to your device! This is a feature that a lot of my previous games would have benefited from. Unfortunately, it’s a lot harder to implement if the game is running in a web browser. For security reasons, Flashplayer can’t create random files on your computer, without help from some external PHP code (or something like that). So this is a feature that the web version won’t have, but will be available on your mobile device instead. This image was made by the app. 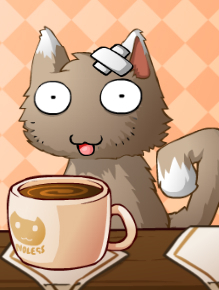 This entry was posted in Cat Cafe, Game News on August 19, 2013 by Matt Roszak. I’m excited for the game, just because you are making it, Matt. I love this! But how do I find the folder with them? I can’t find it but I REALLY want to find it!